The classic tests for measuring Cc and EACN are great. But they can take some time to equilibrate. Acosta's Fast method gives you results in a fraction of the time. It's not magic, you have to set things up correctly with suitable oils and reference surfactants that give good separation. But once you've established the method, you can generate a lot of high quality data very quickly. The methods discussed so far have been the "official" methods that have been used for many years and provide the "gold standard" for obtaining cc and EACN values. But they can be slow and tedious because the time taken for the phases to separate and give a clear idea of what is going on can be very long, depending on details of the system (such as the propensity to form horrid surfactant mesophases). Many of us have noticed that the tube where HLD=0 can be spotted very quickly during the tests, though it can take hours or days to confirm this. It somehow behaves differently from all the others. Although many of us have noticed this phenomenon, it has never been formally supported as a method for determining the HLD=0 point. Fortunately, a paper by the Acosta team1 has formally shown (at least for ethoxylates!) that a method based on this common observation is much faster and just as accurate. The key to the fast method is the fact that when HLD=0, the interfacial tension (IFT) is minimum and therefore the stability of the emulsion (not the microemulsion!) created by mixing the oil/water/salt/surfactant system is minimum. Indeed, in the Separation page we point out that for demulsification, a standard trick is to tweak the system to HLD=0 and the Emulsion Stability app (based on theory from the Acosta team) shows the dramatic reduction when HLD=0. To determine S* using the emulsion stability method, all vials contained in one salinity scan were simultaneously mixed and left to equilibrate at room temperature on a flat surface. The time to separate the excess phases (i.e., the time when the separation front reached its stable position) in each formulation was recorded, and the optimal salinity (S*) was identified as the middle phase bicontinuous lE where the excess phases separated in the shortest time. It is important to note that all the vials contained in the scan must be subjected to the same mixing conditions since the coalescence of particles can be affected by the mechanical energy input. The paper methodically carries out all the standard techniques (including measuring IFT) to determine the HLD=0 points by those accepted methods then compares the results to those obtained by the fast method. The only difference seems to be that the fast method is, if anything, slightly more accurate. One can readily imagine circumstances where it will be slightly less accurate and, of course, there is a loss of the extra information (phase volumes) from the classical methods. Now that the fast method has been validated, the implications are game changing. 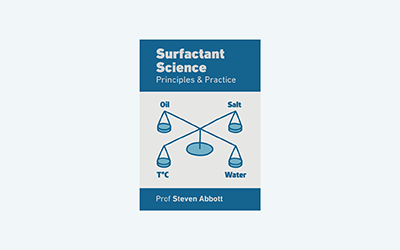 There are 1000s of surfactants and oils that need to be measured and the amount of work via the classic methods discourages most of us who have cost and time constraints. The fast method should allow a well-set-up lab to measure large numbers of values in a comparatively short time. Although the paper is "only" about measuring Cc of ethoxylates, the basic science tells us that it will work for other surfactant classes and for measurement of EACN. The paper adds a key trick that greatly simplifies the process if you don't have a reasonable estimate (from other factors) of where the Cc of your test surfactant might be. Set up a scan with a known, well-behaved, surfactant and with either a salinity scan or an EACN scan, adjusting parameters such that the fast method gives you separation in the central tube when you use 100% of your known surfactant. Now repeat with a replacement of, say, 50% of the known surfactant with the unknown. Does this send the HLD=0 point out of the range of the scan? No problem, just try it with 25%. Does it, instead, not change the HLD=0 point? No problem, its Cc is identical to the reference. More likely is a shift to a higher or lower tube from which you can quickly determine the Cc value of the blend by using the known salinity or EACN in that tube and using the HLD app. From the Cc of the blend it is a simple matter to find the Cc of the mix and then from the Cc calculator app and from the known Cc, the known MWts of the two surfactants and the known ratio, the Cc of the unknown can be found by adjusting the slider of the unknown till the calculated value equals your measured value. To be sure (and to accommodate any non-ideal mixing behaviour) you can try a different % of the unknown and use the new tube position to re-calculate the Cc.